TL;DR: With MetroPCS, you have two different unlock options; Temporary Unlock and Permanent Unlock. If you otherwise want to unlock it temporarily for travel, you can do it on your phone with the Mobile Device Unlock App (Android). On the other hand, iPhones and other unsupported Android models will be unlocked using a sim unlock code. To unlock your phone permanently, you have to qualify with the MetroPCS unlock requirements. Third party unlock providers (UnlockBase), however, do not have any unlock requirements to get your phone unlocked. If you are here to know how to unlock a MetroPCS phone, then you are in the right place! We got you and we’ll tell you exactly how to get your phone unlocked in a fast, easy, and convenient way! MetroPCS has several unlock types and methods for both Android and iPhone. Most Android devices use the Mobile Device Unlock App, while iPhone users has to undergo the manual unlock process. Today, we will discuss your unlock options and the methods to get it done. Aside from discussing how to get it unlocked with MetroPCS, we will also tell you how third-party unlock providers like UnlockBase, help you unlock your phone in a fast, easy, and convenient way. So, stay tuned! The MetroPCS customer service team can help you with unlocking your phone, and they will provide you the information you need to get it done. However, in order for you to unlock your phone through them, your account has to qualify with their unlock policies. To save you time from calling them, we have prepared a bullet list for you, for a complete and more thorough look you can also check out MetroPCS Phone Unlock Policies. Must have had active service for 90 consecutive days from phone’s activation date. Warranty exchange handsets, 90 days starts with the original phone’s activation date and not the activation date of warranty exchange handset. 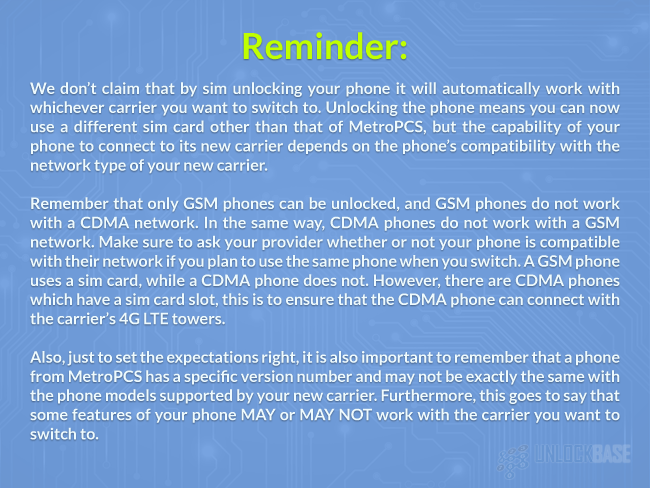 That’s practically the only thing you should take note when you want to unlock your phone through the MetroPCS customer service. If you think you don’t qualify with their 90-day active status, thankfully, you have another option, and that is third party unlock providers like UnlockBase. 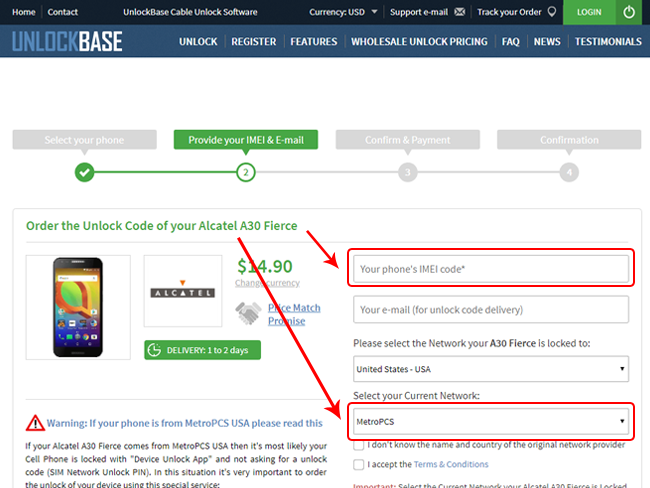 UnlockBase won’t ask or require of you anything that is specifically alike the MetroPCS policy. However, just like any third party unlock service providers, UnlockBase also have a specific set of pre-unlock requirements to make sure that your phone is permanently unlocked successfully. When these pre-unlock requirements are met, you are guaranteed of a refund in the unlikely event that the UnlockBase unlock code/method doesn’t work. UnlockBase is one of the pioneers or the phone unlock service industry. With over 5 million unlocks and over a decade of service, the UnlockBase team has built a strong league of suppliers that are helping them innovate the unlock process to make it easier and also help them reach more people all over the world. There are a lot of phone unlock service providers out there, but we will be basing the steps and processes on UnlockBase. The unlock process is virtually remote and most probably won’t need much of human intervention. These are the most important unlock requirements we set before we unlock your MetroPCS phone. 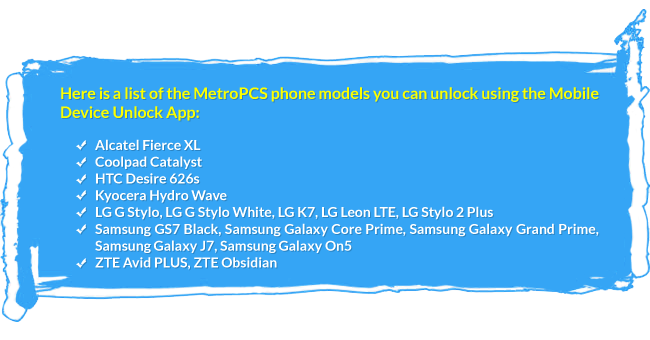 We do have a broader list than this that is specific to the device that we are going to unlock since we have 3 different unlock categories for MetroPCS. 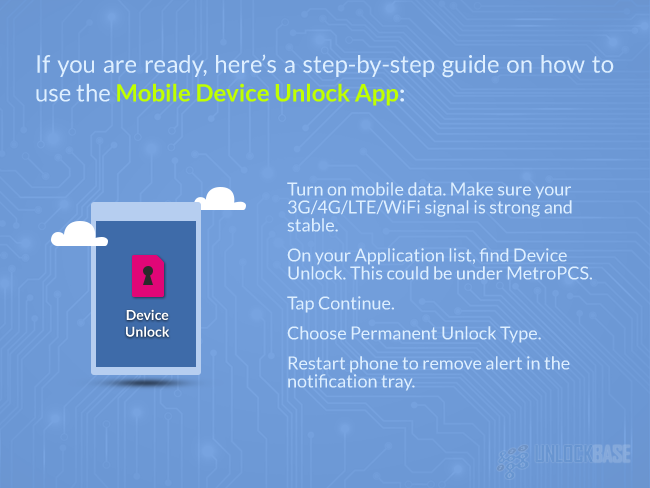 Only a select set of Android devices has the Mobile Device Unlock App pre-installed, and you can use that app to have your phone unlocked remotely without calling MetroPCS customer service. And the other Android phones that’s not supported by the app will be unlocked using a SIM Unlock Code. Now, it’s very easy to distinguish which way you should proceed because there are only a few phone models under the first option. If you are using an iPhone, we have a completely different process for unlocking that. On the other hand, if you are using any other device beyond the list we will provide you below, then your only way to unlock is through a SIM Unlock Code. As mentioned earlier, these are the ONLY set of phone models supported by the Mobile Device Unlock App. If your phone is in any of the devices listed above, then here’s what you need to know about how to unlock it. The Mobile Device Unlock App is an app that lets you automate the unlock process, eliminating the need to enter an unlock code in the Sim unlock process. It lets you temporarily or permanently unlock your phone with just one tap. We have a different article on how to use The Official Mobile Device Unlock App, but we’ll go through a quick run-through about the app here. As mentioned earlier, it’s already pre-installed on the supported MetroPCS phone models. The app will also uninstall by itself if you’ve successfully permanently unlocked your phone. Turn ON mobile data. Make sure your 3G/4G/LTE/WiFi signal is strong and stable. On your Application list, find Device Unlock. This could be under MetroPCS folder. Restart phone to remove alert in the notification tray. 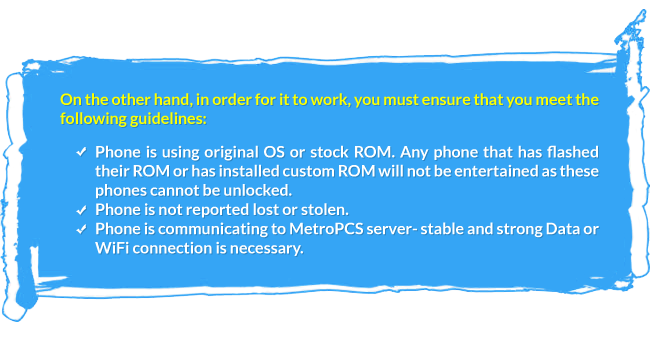 Take note that it is important to ensure that your phone is able to communicate with the MetroPCS server for the unlock process to be successfully finished. 1. “Server Error” – it means that your phone isn’t connecting to the server because you have a weak/bad internet connection. 2. “Unlock Failed: This mobile wireless device is not eligible for unlocking. 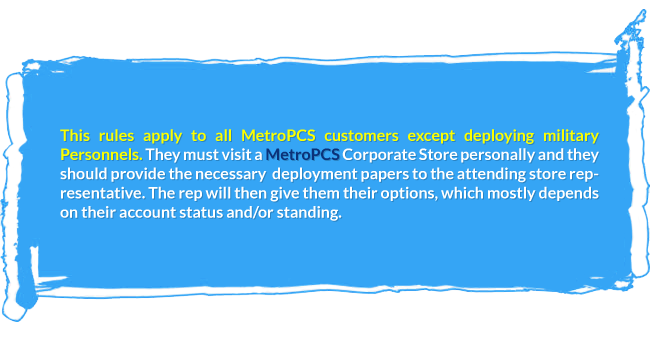 For Device Unlock eligibility details, please go online or contact Customer Care” – this means that your phone is connecting to the MetroPCS server but it’s not eligible for unlock according to the carrier’s requirements. If you want to unlock your phone via the Mobile Device Unlock App, click on the button below. If you are using an iPhone or another Android device that isn’t supported by the mobile device unlock app, then you have to unlock your phone using the usual unlock process we do here in UnlockBase, and that is through a SIM unlock code. All we need is your phone’s IMEI or serial number for us to be able to calculate the code. You can check your IMEI by dialing *#06# on your phone. For this, the unlock method will depend on the make and model of the device you are using. We support almost every mobile device brand/manufacturer so that won’t be a problem. We’re certain we can help you out. Just head on to the Unlockbase Homepage, enter your IMEI, and choose MetroPCS as your carrier. Once your order is received, you will receive an email from us about our Pre-Unlock Requirements, and it will depend on the device you are using. Please follow the instructions accordingly as this agreement shall be your key to a refund in the unlikely event that our unlock code didn’t work. UnlockBase has a committed and highly knowledgeable tech support team that’s ready to answer your questions and walk you through the unlock process when you need it. Our customer service and tech team are available 24/7 to help you. Unlock with us now and increase your phone’s worth!